2008 December | The World Around Me Now A Blog! Some 50 million copies of the books have been sold worldwide and the series has been translated into over 20 different languages according to Wikipedia. Other sources says that the four Twilight books have been sold in more than 25 million copies worldwide and 20 million of them have been sold in the USA alone. Taking a cue from this phenomenon, ABS CBN is allegedly going to produced a Pinoy version of Twilight entitled Takipsilim ( Filipino translation of Twilight). Starring Rayver Cruz as Edward Cullen and Shaina Magdayao as Isabella Swan. News of the Takipsilim, alerted the Filipino Twilight fans, many blogs featured the announcement of ABS CBN, and so many reacted negatively and some the wait and see attitude. The reactions were more about who will play the lead roles. I am sure no matter who the actors are, we will still be curious about the tele-movie, we will still watch, because we have fallen in love with the romance story. But again, latest news says the Twilight Pinoy version is a hoax. If the production pushes through, let us not compare, because the tele-movie will be an “epic fail” for sure, when we try to expect what was depicted in the original movie or in the novel itself. I am sure there will changes and the Filipino way of love story will be an added attraction. “Kilig “ factor will still be there guys! Don’t react too violently, lets see. Give a chance to Takipsilim (if there is will be one), the Twilight Pinoy Version !Its Entertainment , Its show Business! Ang Pasko ay sumapit , tayo ay magsi-awit ng magagandang himig dahil sa ang Diyos ay pag- ibig… the famous and most requested song during the Christmas season in the Philippines. One of the longest and eventful celebrations in the Philippines, it brings to life the Filipino tradition of hanging “parol” (colorful lantern), and attending “simbang gabi” ( novena dawn masses), noche buena ( a family gathering after the midnight mass with gift giving or just family bonding). On Christmas day, a visit to ninangs and ninongs (god parents) and family elders for their “aguinaldo’ (gifts in cash or in kind). Holding Christmas parties has been part of the celebration, where activities would be parlor games, raffle prizes, dancing contests, the kris kringle, food and booze all done for the fun and camaraderie. It might be a lot different today on how I spend my Christmas. This is the time that I’ll be at home most of the time, lots of rest and bond with my children. The food will just be the same, fruit salad, ham, drinks, fruitcake, pasta carbonara and the newest addition the ginger bread house. I would complain that Christmas is so stressful, for you have to prepare a lot of things, buy groceries, spend for gifts, cook ,arrange the house etc, but this Christmas I did forgo a lot of the usual activities and I’m relieved, I promise my self, enough of those activities but not necessary to break the essence of Christmas itself. I’ll make my wish list instead for me alone … my own lightweight laptop that I can carry around whenever I go so that I can enhance more my writing needs, good health for the whole year, being able to regulate by PMS tantrums. At the same time a cheerful disposition in the face of whatever I may feel physically or emotionally. More leisure time, do things that I enjoy and let go of unnecessary activities. The worst events in my life happen during the Christmas season. Each year I try to make it better and different from the previous year. I am sure I am more relaxed and this is a merry Christmas for me. Tonight as a family tradition, we will attend the mass. Greet the One who have made everything possible. Glory to the NEWBORN KING! Manny Pacquiao … What I like about him. Fifty-three fights, 48 wins, two draws and three losses (1996, 1999 and 2005). Thirty-six of his 48 wins or 75 % were by knock out. He has won 9 times since his last loss to Erik Morales in March 2005. He has been the unbeatable champion for the last 4 years. His 33 fights out of 53 or 62 % were against foreigners (Mexican Americans, Thais, and Japanese etc). Since the year 2000, his twenty-three ring encounters had foreign opponents. He is the first Filipino boxer to win four world titles in different weight divisions (currently WBC Lightweight Champion, former WBC Super Featherweight Champion, IBF Super Bantamweight, WBC Flyweight). When he trains, he trains hard. As depicted in news report about his training, he always shows the determination and the willingness to learn and focus on what he does best, boxing. Maybe his mentors, his coach and trainer did influence him a lot but still it is still his eagerness and determination that always prevail. Coupled with his spirituality, as shown in every round and at the end of his game, wherein he pause for a while at his ringside to kneel down and offer a prayer of thanks. 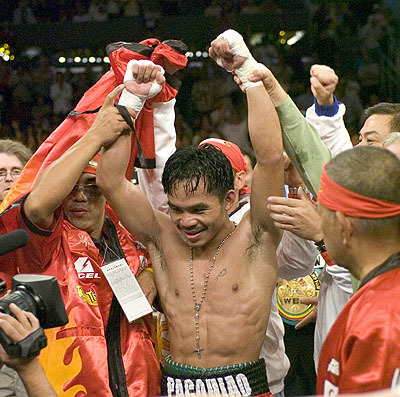 Manny Pacquiao, “Pambansang Kamao” & “People’s Champ” or simply “Pacman”made us proud as Filipinos. Some people were against him in fighting dela Hoya for the reason that it was a mismatch. He reasoned out that when he was younger he used to fight for fifty pesos, now that he is an accomplished fighter, he had no reason to back out, not with a 10 million dollars guarantee on his cap. He was right, he hurdles the fight very well. Luck and fate maybe really on Pacman , but his perseverance, determination, and hard work when he trains put him to where he is now. Manny Pacquiao, Filipino, Champion Boxer. Bloggers had their day at Fully Booked, Bonifacio High Street in Global City last November 28, 2008. It was the launching of the Fully Booked Bloggers Book Club (BBC). Exciting activities await its members, such as book launches, author meet and as exclusive contributors to a book review section “Spotlight Review”. Fully Booked will award the best Blog book reviews submitted by BBC members. There will also be a website forum, in which online book discussions with other booklovers and bloggers can take place. The Fully Booked branch at Bonifacio High Street is the biggest and a building of five stories. The basement boost of U-view, a fully functional movie theater, with a sitting capacity of 50 people, perfect place for screenings, movie premier and corporate events. At the Atrium, a showcase of what is in every floor. At the second floor, one can see children’s books and lifestyle titles. Up the third floor, there is Starbucks, business and professional selections as well as inspiration books. For the hype ones, the fourth floor has music and videos and Forum , a venue for book launches , workshops and classes. At the roof deck is Top shelf, which offers a panoramic view of Bonifacio Global City and an ideal venue for events. My children have always been fond of Fully Booked. There would never be a stroll at any mall without going to a bookstore and that’s Fully Booked. We frequent the branch at Gateway Mall in Cubao and at Bonifacio High Street almost every week. My youngest Roxanne would go for Manga books and now, the Twilight collectibles, Dianne collects Paulo Coelho books and bestselling fiction books, Jeric for his Moleskin and me for my lifestyle magazines. I would sit at Starbucks for a round of coffee while reading my magazines as they roam around for their book finds. Fully Booked has eight stores, Rockwell Power Plant. Promenade in Greenhills, Gateway Mall. SM Mall of Asia. SM North The Block, Bonifacio High Street, EDSA Shangri-la and Ayala Center Cebu.